I was trying to call a friend this morning, on my iPhone, and somehow his number and contact information were gone. Why did his number disappear? I was told this evening at Krav class that it was because I failed to backup the number on iCloud. What cloud? I honestly had no idea what this was about but it was said in such a way as..."C'mon, how could you not remember to backup your i Cloud? Do not act like you do not understand what I am saying." I remember as a child when I wanted to use the phone I just picked up the receiver, dialed 6 digits, and presto, I was speaking to a friend. Today it is so much more complicated. It seems that if you are not a Hi tech wizard you are going to run into serious trouble and even making a simple phone call can get really complicated at times. I will be honest, I miss those days. When our mother wanted to call us for dinner she opened the door and let out a yell, making a phone call was simple, shopping was simple, credit meant writing it down on a notebook (which of course was just a...notebook). Today we have so many very complex time saving devices that one must be constantly learning new skills just to keep up the ability to write a letter or make a phone call. It seems our time saving devices use up a great deal of my personal time. With all our "advances" of course we are also losing a great deal. Some of the younger people will never know what they are missing. So much has been lost that when we look at ancient times we often are so perplexed we must ask, "but how could they have built that without our modern technology?" We are so arrogant to think that we are the smartest generation that has ever lived. If anything we have certainly complicated our lives and created problems that never existed before. We are so very clever that we are destroying the earth and all it contains. Sadly even martial arts have gone in this direction. The movies will have us believe that the Ninjas and the Samurai of old used complex techniques and the death touch and so on. But the fact is that they lived shorter lives and would not have had the time to learn such complex arts. Most likely they were simpler, and yet more effective, than we imagine. Our goal, IKI Krav Maga, the latest evolution of Krav Maga in Israel, is to return to simplicity. It is not a matter of nostalgia, in fact we are probably the most HI Tech society in the world. It is simply a matter of efficiency and doing what works under pressure. The more complex and the more computerized the car is, the more there is that can go wrong and the more difficult it is to repair. Same for most of our current devices and appliances. With Krav Maga, with self defense, we need something that can work under the worst circumstances, when we are tired, unprepared, alone, scared. We need to revert to basic instinctive moves that are natural to our bodies and easy to use. When it comes to self defense we need to go low tech, simple moves that are in sync with our bodies. I yearn for simple devices that get the job done and do not fail so often and do not need to be "upgraded" every few months. When I buy a pair of shoes I just show the guy at the store what I am wearing and ask for the same pair. I do not want an "upgraded" pair, just a pair to replace the one that has served me well but is now worn out. I still remember our simple white phone, one phone for the entire family. When I wanted to see my friends, I walked over to their house and knocked on the door, (at least I got some exercise doing it). Our simple white phone, you pick it up, dial six digits and wait. No iClouds, no updates, no passwords, it was reliable and efficient and simple. And somehow, without iPhones or SMS we still managed to gather our entire reserve forces when we were attacked by our neighbors on our sacred Day of Atonement, Yom Kippur, back in 1973. We were ready and we responded. We still are. Krav Maga, keep it simple and effective. Nothing fancy; no acrobatic moves, save that for the theater, no dance moves, save that for the ballet studio. Keep Krav Maga real. There is no way to truly grasp Israel until you arrive here, not as a tourist. Live with us for two weeks, meet the people, learn the history and the culture and immerse yourself in the Israeli fighting system and mindset known as Krav Maga. Make no mistake about it; this is not what you will find in your local American style of Krav Maga. 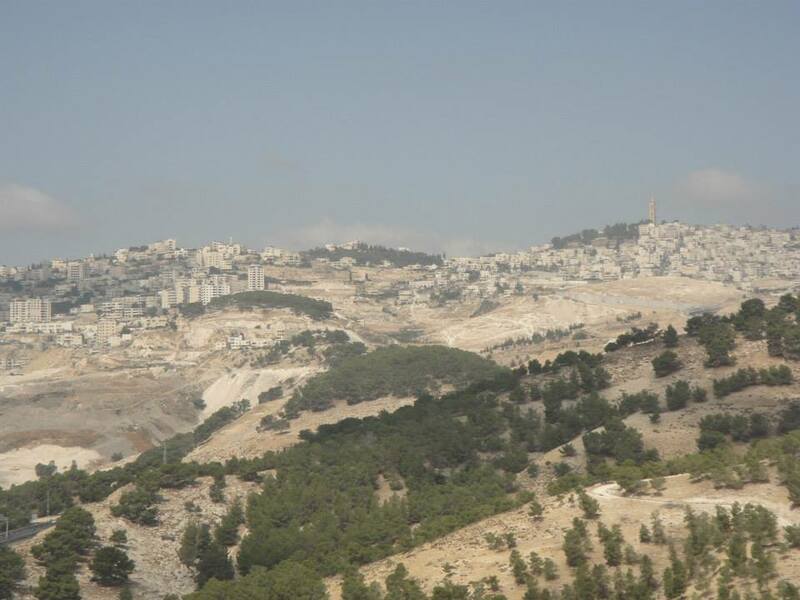 View from our town, Maaleh Adumim.